Cats are Cute is a delightful little game by Kkiruk Studio. It has brilliant hand-drawn visuals, which look straight out of a child’s art book. You will instantly fall in love with the surroundings and every animated cat. You can interact with them, play hide and seek, feed them or just listen to their rants. 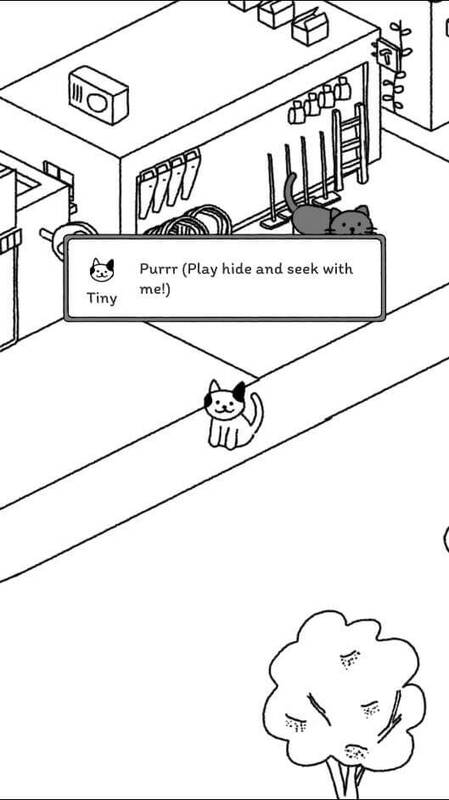 At its heart, Cats are Cute is a kitty collector game. So along with taking care of cats, you can also collect lots of purry felines of all shapes and sizes. The game offers a straight and easy way to get them. All you have to is tap “Shop” and obtain kitties from three types of draws. However, to get a cat from a draw, you will have to do some hard work and earn resources, such as fish and cat grass. With the help of these tips and hints, you will easily earn them to obtain lots of kitties. You can also watch our gameplay video to know how to get resources and collect cats from various draws. First up, you should know how to use the cat draw. It’s the best way to get adorable kitties. A cat draw is divided into three types: Normal, Premium and Event. In a normal draw, you can get a normal or rare cat. There is a 70 percent chance of getting a normal or common cat and only 30 percent chance of obtaining a rare kitty. Duplicate cats will turn into “toys”, which can be used to learn special cat skills. You will need 6000 fish to start a normal draw. Premium draws let you to discover a normal, rare or epic cat. There is a higher chance (50%) of getting a rare cat in a premium draw. However, chances of acquiring an epic cat is only 15 percent. Surprisingly, there’s a 35 percent chance of getting a normal cat in a premium draw which is less than the chances of obtaining a rare cat. You will need a minimum of 600 catgrass to start the premium draw. Obtaining cat grass is harder than fish, although there are quite a few ways to get them for free. We have discussed various ways to get them, so read on. In an event draw, you might get a normal, rare of epic cat. There’s a 35% chance of getting an epic cat and 40 percent chance of acquiring a rare cat. Chances of obtaining a normal cat is only 25 percent. 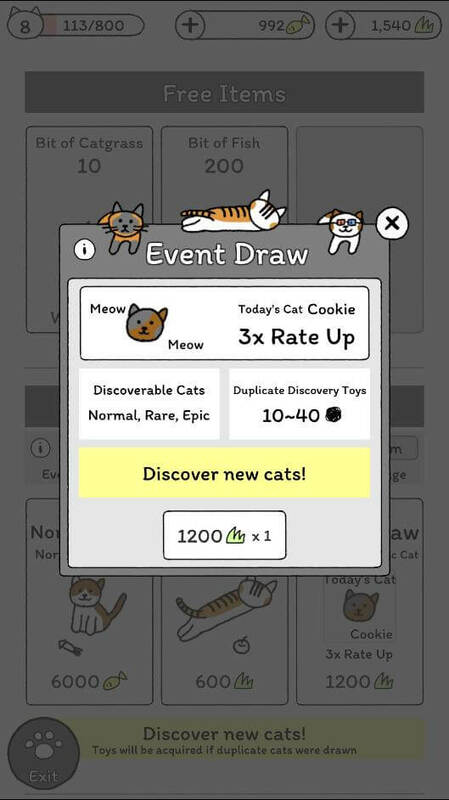 Each day a new “featured” cat is shown under event draw, suggesting higher chances of getting that cat. There is a 3x chance of getting an epic cat. You will need 1200 catgrass to try the event draw. You will get a certain amount of fish per hour from each building. Every time you acquire a cat, you will be able to build a special building for her. In the tutorial mode you will be able to build one house for “Tiny” the cat. Later you will build more when you acquire more cats. At first, each building produces 200 fish per hour. You can increase the fish production rate by leveling it up. Leveling up not only increases fish production but also increases storage. You might also receive free cat grass as “level-up bonus” every time you upgrade your building or level up a cat. You will need a certain amount of fish to level up a building. Tap a building to upgrade it. Make sure you use fish for building upgrades. Don’t waste them for decorating a building or learning a new skill. Chances of failure are more if you try to learn a new skill for your cat. Your priority should be to produce and hoard as many fish as possible if you are planning to collect lots of cats. Always try to upgrade all existing buildings in the town as quickly as possible to increase the production rate. 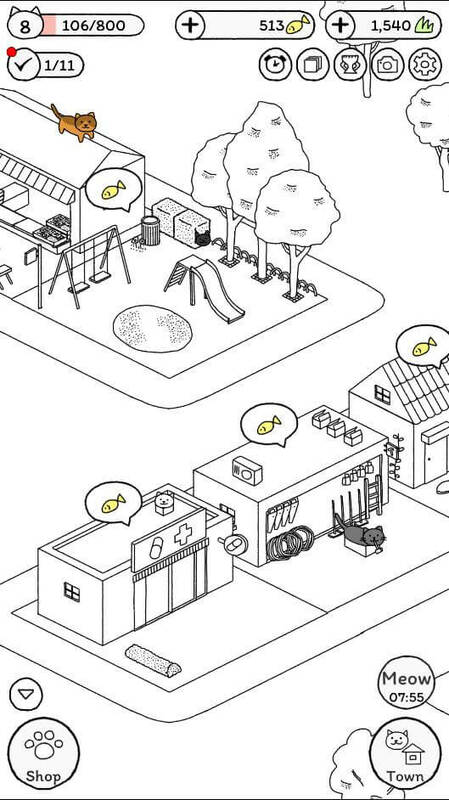 Tap to collect fish when its icon appears above each building. When you reach a new “meow” level, you will receive lots of fish and grass as bonus rewards. Tap the ground to get the required number of hearts to increase your “meow” level. Your meow level is connected to each building’s level. So, if your meow level is 3, the max level a building can reach is 3. To lift the level cap, increase your meow level to 4 and all buildings can level up to 4. You can check your meow level by tapping the number on the upper right corner of the screen. It also shows your profile page that displays your current level, how many cats you are looking after, how many buildings you have built and info about a new friend. As you reach new meow levels in Cats are Cute, the heart requirement will keep piling up. Besides tapping the ground, you should find other ways to get hearts if you want to fill the heart bar faster. The best way to get bonus hearts is to interact with your cats. From time to time, an interaction call-out icon appears about each cat. When it’s shown above a cat, tap to interact with her. You will have to feed her, play hide and seek, chat with her or just watch her for a few seconds to get hearts. The interaction call-out above a cat suggests an activity. Tap it to know what your feline friend wants. To feed her, tap the bowl until it’s full of cat food. In hide and seek, your cat hides behind trees, in the lake or buries herself in the ground. You will have to scan the town to find her. You might spot her tail or head behind a tree. Find her before the time runs out to get bonus hearts. Don’t worry if you can’t find her, your cat will win but still grant a few hearts. To chat with her, just tap the call out and read what she has to say about you. To watch her, don’t tap the screen until the timer hits zero. The more hearts you collect, the faster the heart bar fills up. And when it fills up, you raise your meow level to get bonus fish and cat grass. If you are tired clicking and want lots of hearts by interacting with your kitty, just level her up. Leveling up requires fish, so make sure you have plenty of fish to level up each cat. Complete goals to get cat grass. Tap the trophy icon located on the upper right corner of the screen to get a list of goals. Complete them one by one to get lots of grass. You can also get free cat grass if you complete “cat collection”. Tap the icon on the left side of goals to access collection. You will have to collect matching cats to complete a collection. For example: If you collect Tiny and Fatty, you will complete the “Best Furriends” collection and receive cat grass as rewards. Playing Cats are Cute for a certain number of hours grants bonuses such as fish, grass, toys and hearts. Keep an eye on the timer icon on the upper right corner of the screen. When you see a red dot on top of it, tap it and tap OK to claim your rewards. The playtime bonus resets everyday so make sure you check what’s new daily and keep playing the game to get your rewards. You can find “mileage” just above events. Tap shop and then check the mileage section to know your current status. The empty white circles on the mileage bar are key points you must reach to get rewards. To reach the first mileage you should earn points which you can receive when you collect your rewards from a draw. You get 1 mileage for a normal draw and 2 mileages for event and premium draws. When you reach the first mileage, i.e. the first empty circle, you will get 1 normal draw and 1500 fish as rewards. Reach the second one to get a free premium draw and 3000 fish. Reach the third to get a free event draw and 200 cat grass. Mileage rewards may change after you complete all three. Just tap the tiny “i” to get a list of rewards. Noticed that yellow circle on the lower right corner of the screen? Well that’s “Meow Time”. It lets you collect hearts and fish. Tap this circle and then quickly tap those fishes before the timer runs out. When you finish, the game shows the amount of fish and hearts you have earned during meow time and will give you the chance to double your rewards. All you have to do is watch an ad to get 2x rewards. Another way to get event tickets, fish and cat grass is by playing the game every day. You will get them as daily login rewards. All rewards reset at the beginning of a month. If you have just began playing, then you will get additional rewards if you play for seven consecutive days. The bonus 7-day rewards are exclusive cat grass rewards, so don’t miss them and keep playing for seven days to collect them all.